This year’s Fair promises to be bigger and better than previous years and I cannot WAIT. I live in hope that three days will be enough time to explore all of the stands over two shopping villages as well taking part in some of the workshops that will be available. There will be ample chance for me to try new things, improve my skills and get chatting with like minded people. I can’t help but wonder if I might get to have a little cuppa and a chat with Kirstie herself (Kirstie if you are reading this, get in touch so we can arrange our rendezvous ;-) ). I may even be tempted by a VIP ticket! I would just like to put it out there that if you know someone who loves to get crafty, this could possibly be the ultimate birthday gift. Bring on the bubbly! Not that I want to name drop but there are going to be a number of expert crafters there too including Annie Sloan and Mr X Stitch. What is not to love about this?! In my true enthusiastic nature, I simply cannot wait until September to meet all of these wonderful people so I am bringing them to you via Mrs Crafty B with some show exclusives! Now for the most exciting bit. I want to see pictures of all of you #CraftyBs enjoying The Handmade Fair so I am going to have to get you there. What better way than to offer you (courtesy of the show organisers) a #CraftyBs discount! You can book your Full Experience tickets for just £27* (a saving of £5) using the code CRAFTYB when you book before 31st August. 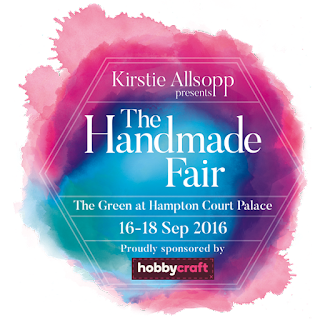 Get the date in the diary, get those tickets booked and as soon as you have, tweet me, @MrsCraftyB and @HandmadeFair to tell us that you will see us there. Why not tweet us a little pic of your happy #letsgetourcrafton face?! Don't forget to keep your eyes on the blog! Thanks so much. I hope lots of #CraftyBs take advantage!